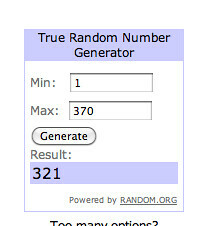 Thank you all so much for your comments on Monday’s blog giveaway post! It is wonderful to read your stories of knitting on the go. And I think it says a lot about knitters that so many of us are so prepared with all sorts of different items where ever we go – not just with knitting! But you’ve got to admit, having knitting makes a lot of times a lot easier. Knitting continues around here this week, on a few different fronts, and I’m excited to be bringing a few new patterns your way in the coming month! Including at least one free pattern here on the blog. I’m continuing to make way for a few new projects just for myself this month as well, so that I’ll be comfy and cozy for the winter as well as hopefully a few gift recipients. My new Podsters are coming along nicely, and I do believe I’ll post a slightly revised version of this pattern when I’m done. I think there could be a better differentiation between the smaller and larger sizes (so that the small is more…smaller), so look for that soon at the very least. And in other news, November has been dubbed by online knitters as “National Sweater Knitting Month,” or “NaSweKniMo” – an answer to “National Novel Writing Month” or “NaNoWriMo” (affectionately referred to as NaNo) – and while I didn’t cast on for a new project November 1st as the rules would have you do, I do fully intend to finish one of the current sweaters on the needles before the end of the month. I had such hopes for October. While I did get my Rhinebeck sweater finished, it turns out that after carting my Gwendolyn sweater and my as-yet-unfolding Briar Rose Abundance sweater around with me, as November dawns I still have a grand total of…two pairs of sleeves, and one hem. I think I can improve on that progress! Here’s looking at you, November. What do your November knitting plans include? 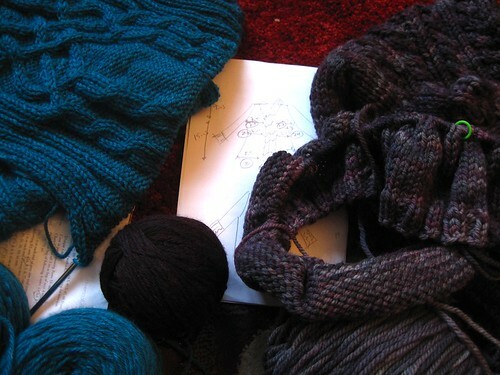 Will you be casting on a new sweater, or are other projects catching your eye? I’m test knitting a sweater and I’d like to make socks for my brother for Christmas. That will probably take up most of the month! This is my fourth year doing NaNo. I’m not sure I could handle a sweater and an novel in the same month! Then again, I have yet to knit a sweater at all…… so yeah. I’ll stick to noveling for this year and look forward to a sweater next year. Well, I finished a sweater in September and haven’t found any pattern that has moved me to start another one just yet. Finishing up socks for a Christmas present (two pairs Christmas present socks already done) and starting another pair of felted clog slippers (also Christmas presents). Maybe socks and a sweater for me are in the new year. Love your blog! I definitely can’t do a sweater as of yet… but lately I’ve been hankering to do a Pi shawl. I’ll be casting on a shawl for a KAL and finishing a baby sweater for my son. And then starting another one. Somewhere in there I’d like to make a hat and a pair of podsters for my husband, which might have to wait until december. Hoping to finish up the DH’s sweater (cap of one sleeve, wash/block, neckband!) before we leave. Not really holding my breath. 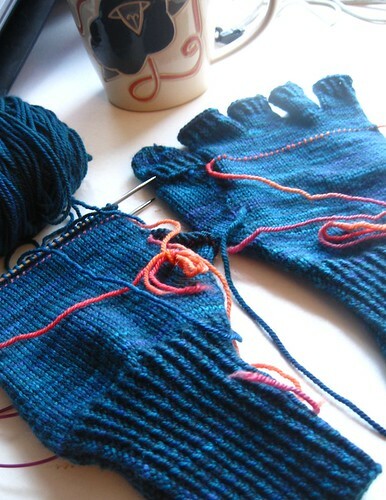 Your gloves are coming along nicely and I can’t wait to see your finished sweater! I’m doing NaNo and NaSwe (yes I am out of my mind). My 9 year old son is desperate to have a pair of posters but I think the small size would still be too big. Any suggestions about how to downsize the pattern to fit a child? congrats Laura. i am still to afraid to make a sweater so i will finish the wrist warmers for my son for his b-day. then i have to make a pair for my hubby for Christmas not to mention i have another b-day gift to finish and get in the mail by Dec. 1st or it won’t get to the States in time for a friends b-day. after that i’m not to sure what i’m going to do. I’m going to finish a family of hats. I was getting close to completion with one and found a spot that I didn’t like. Frogged! I’m now getting back to where I was on that one. I also need to start my mom’s Christmas gift. I also have a Tardis scarf that I’m attempting to put together and start. Busy, busy, busy. Just about ready to cast on for a sweater for my small great nephew; he lives on a farm and adores tractors. The sweater has a big old John Deere on the front! Oh, and two baby blankets. And a couple of pairs of socks. And a hat and matching mittens for Tractor Fan’s younger sister. I’m really hoping to finish my Christmas knitting soon and cast on a sweater for myself. I have yarn lined up for THREE sweaters (one of them your Stage Door Cardi), and I can’t wait! Does purchasing yarn and casting on a swatch for baby sweaters count? Also for November: figuring out how I want to finish the first of my own shawl designs! May need to whip out some wrist warmers. The place I’m currently working is roughly 10 degrees F (5 degrees C) warmer than out-of-doors and I can’t work the computer while wearing mittens. I am planning to cast on my first sweater!! which is going to fill a hole that an old one, worn for years, must soon make (i.e. it is too beat now to be used!) It feels great to know that I can knit the same (or a very similar one) back into reality :)) !! I’m currently mostly through my first Bunny Chunk (Rebecca Danger) and then it’s off to revise my own Kobo Cozy … for the new Kobo is smaller than my dinosaur Kobo. After that, it’s Knucks for Auntie Inflammatory, in hopes that they’ll keep her fingers warm and arthritis-free. Hopefully two pair in time for Christmas! I also have travellin’ socks on the go at all times and they’re currently just toes, but they’re my first two-ups … toe-up, two at a time! They go where I go. I don’t want to get into a sweater at the exclusion of everything else at this time of year, but I’ll be starting another, maybe in January. I have a massive amount of homespun blue-faced leicester that I want to turn into a natural-coloured shawl. So much to do – I can’t wait! Beautiful colors and patterns! I love the mittens! They look so warm! I’m making the most of my knitting mojo while I still have it; it’s been really on/off this whole year. So I cast on Ysolda’s Cotton Reel mittens and I hope to knit at least one hat before November is over as well, for a birthday present. I hope to finish the mittens too, come to that – after moving my dad can’t find my leather mittens to send to me, and I think he’s becoming increasingly exasperated with my “poor moving/packing skills” that I won’t subject him to any more of that. 😉 I won’t get back home to find the mittens until Christmas, and it’s starting to get chilly *now* (though it really is a lot warmer currently than I feel it should be…). Wow, I didn’t even expect it! Thank you so much! I had to laugh out loud about NaSweKniMo as two members in my household will be participating in NaNoWriMo as well as a friend in London and I also recently heard about NaBloWriMo (or something like that). But November being sweater knitting month is a perfect incentive for me as I’ve been so intimidated about casting on a sweater pattern. So, I’m going to take the challenge and knit a sweater this month … I have so many on my queue that I’m not sure which one I’ll attempt, but thanks for nudging me along!